Sir Alex Ferguson says Robin van Persie is “lucky to be alive” after being hit in the head by a ball struck by Ashley Williams in the 1-1 draw with Swansea. Van Persie was lying on the ground when Williams kicked the ball from a couple of yards away as the referee blew the whistle for a foul. Ferguson felt Van Persie was fortunate to escape serious injury. “Robin van Persie is lucky to be alive. It was a disgraceful act from their player,” Ferguson told BBC Sport. The United manager said Williams, 28, had deliberately aimed the ball at Van Persie, who reacted furiously – both players were cautioned by referee Michael Oliver. Ferguson added on Sky Sports: “With the Van Persie situation, you can clearly see that he could have been killed. “He should be banned for a long time because that was the most dangerous thing I’ve seen on a football field for many years. “It was absolutely deliberate. The whistle has gone, the game has stopped and he has done that right in front of the referee, he could have killed the lad. Williams denied he had hit Van Persie intentionally. “I’ve seen it on the TV and that’s his [Ferguson’s] opinion,” said Williams. “Everyone’s going to have their own opinion but, from my point of view, I tried to apologise on the pitch but it all flared up. “I just kicked the ball in frustration and obviously not trying to hit him square on the head. United striker Wayne Rooney tried to play the incident down. United led the Premier League by six points going into the weekend’s fixtures but, after the draw with Swansea and rivals Manchester City’s win over Reading, that advantage has been cut to four points. “It should have been six. That’s the disappointment,” added Ferguson. 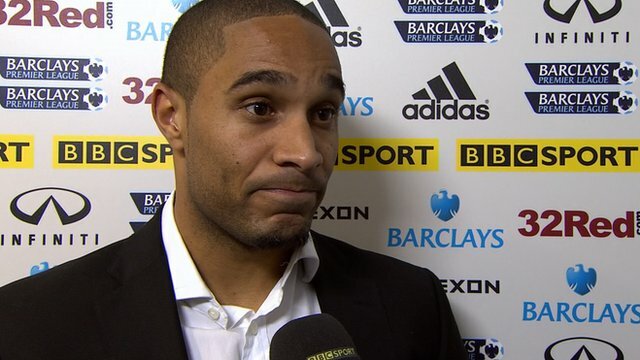 “We absolutely battered Swansea [in the second half]. “In the second half it was a marvellous performance by us and we were unlucky not to win it. We struck the bar twice and had some great chances. 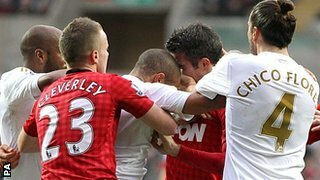 The United manager was angry that referee Michael Oliver, 27, did not disallow Swansea’s equaliser for a foul by Chico on Van Persie during the build-up to the goal. “It really it should have been a foul for us when the defender fouled Van Persie but the referee has had one of those games,” said Ferguson.